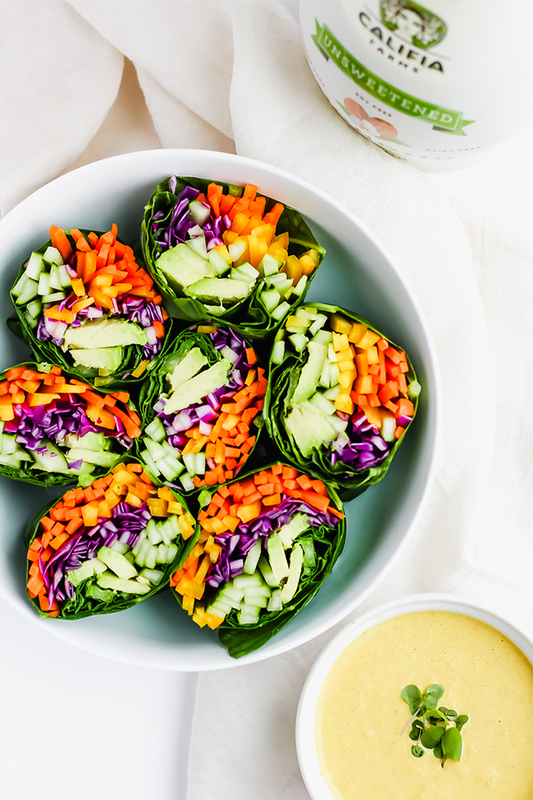 If you’re looking for a vibrantly fresh and satisfying lunch recipe that doesn’t scrimp on flavours then look no further than these crunchy raw rainbow veg wraps. 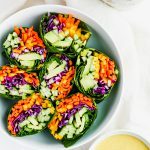 If you're looking for a vibrantly fresh and satisfying lunch recipe that doesn't scrimp on flavours then look no further than these crunchy raw rainbow veg wraps. To prepare collard greens, take your huge collard green and cut off the stem right where it meets the leaf. Then take your knife and run it down the part of the stem that goes up into the leaf, shaving off the part of the stem that protrudes from the leaf (this will allow the leaf to be more pliable and bendy). Place leaf in a shallow, wide pan of just-about-boiling water for 3-5 seconds, remove and immediately place in an ice bath for a minute or two. Then place on a paper towel to dry. Place the desired combination of filling ingredients in the middle of the leaf. Fold collard green around the filling like a burrito. Cut in half for serving. Combine Dressing ingredients in blender (a mini food processor immersion blender would work too) and blend until fully combined. Serve wraps with dressing.